Specker, Jona Schermer, Maartje H. N. and Reiner, Peter B. 2017. Public Attitudes Towards Moral Enhancement. Evidence that Means Matter Morally. Neuroethics, Vol. 10, Issue. 3, p. 405. 1. Annas, G. The man on the moon, immortality and other millennial myths: The prospects and perils of human genetic engineering. Emory Law Journal 2000;49(3):753–82. 2. Elliott, C. Better Than Well: American Medicine Meets the American Dream. New York: W. W. Norton; 2000. 3. Kass, LR. Life, Liberty and the Defense of Dignity: The Challenge for Bioethics. San Francisco: Encounter Books; 2002. 4. Fukuyama, F. Our Posthuman Future: Consequences of the Biotechnology Revolution. London: Profile; 2003. 5. Habermas, J. The Future of Human Nature. Cambridge: Polity Press; 2003. 6. Sandel, M. The case against perfection. Atlantic Monthly 2004 Apr:51–62. 7. Harris, J. Enhancing Evolution: The Ethical Case for Making Better People. Princeton, NJ: Princeton University Press; 2007. 8. Savulescu, J. 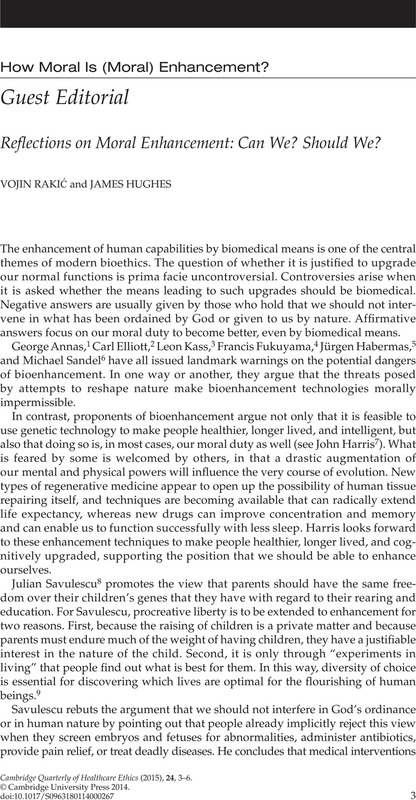 Genetic interventions and the ethics of enhancement of human beings. In: Steinbock, B, ed. The Oxford Handbook of Bioethics. Oxford: Oxford University Press; 2007:516–35. 9. See note 8, Savulescu 2007, at 526–7. 10. See note 8, Savulescu 2007, at 528–9. 11. Persson, I, Savulescu, J. Unfit for the Future: The Need for Moral Enhancement. Oxford: Oxford University Press; 2012. 12. Sparrow, R. Better living through chemistry? A reply to Savulescu and Persson on “moral enhancement.” Journal of Applied Philosophy 2014;31:23–32. 13. Hauskeller, M. Better Humans? Durham, NC: Acumen; 2013.